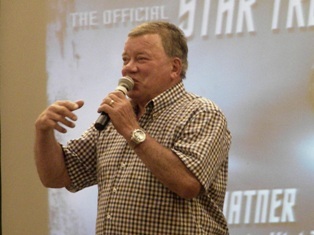 The original James T. Kirk closed Seattle’s Official Star Trek Convention 2013 to a packed house of Star Trek fans. Though it was my third Trek convention, it was my first opportunity to see Shatner. 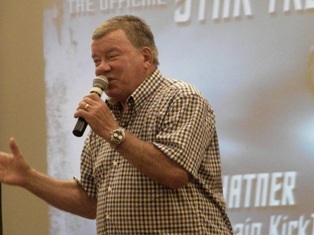 Shatner took the stage late in the afternoon on Sunday, August 25. As Trek nears its 50th anniversary, it’s hard to believe the starship Enterprise’s first captain (not counting Captain Pike) is 82 years old. Shatner entertained the crowd with the exuberance of a much younger man. He focused primarily on his current projects, which include a new album and a documentary about fan conventions. He’s even helping design a line of motorcycles. One thing to note about seeing Shatner speak – there’s not a lot of Trek talk, at least there wasn’t this weekend in Seattle. It’s not that he doesn’t want to talk about Trek, it’s just that he’s obviously more excited about his current projects. Anyone who happens to be at the front of the question line might want to take the opportunity to ask a Trek question if they want some tidbits about his time on the show or making the films. Shatner tended to go off on tangents as soon as any question was asked. Though entertaining, it didn’t leave room for more than four or five lucky fans to have a personal moment with him. With his boundless energy, booming voice, and total rejection of negativity, Shatner expressed a life philosophy that was truly inspiring. This Renaissance man shows no signs of slowing down, even in his ninth decade. His new album, Ponder the Mystery, releases October 8. He has several L.A. performances scheduled to support the album, with a possible tour or Vegas show to follow. Stay tuned for more coverage of Seattle’s Official Star Trek Convention 2013.